A landing page is the page where a straner arrives at on your website after clicking an ad or CTA via social media or email, so it needs to be attractive, eye-catching, interesting and of course easy to understand. Thus, if you have landing pages already created, most probably you would like to increase your conversion rates. 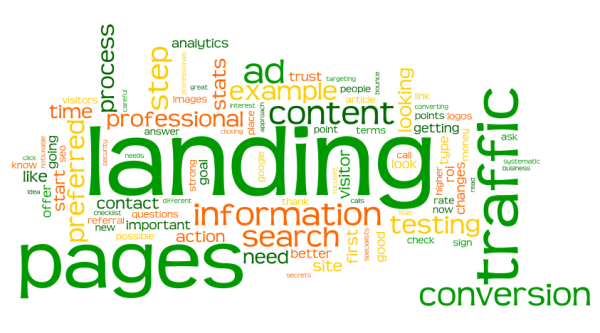 One of the most important things in your landing page is your logo. It’s of the utmost importance for your landing page optimization, especially when you have many landing pages. In this case you can ensure that your brand will be easy recognizable and your visitors will feel safe and comfortable to take actions. In addition it will help you to look more trusty, as the website without a logo is the same as selling watches without a brand. In order to gain engagement, you should have some information gathering fields in your landing page. There are several ways to gain information about visitors from the website. First of all, you can add some forms in order to obtain information about visitors by encouraging them to fill out the forms. You should make sure that it’s in a visible place of your landing page. Another way is to have pop-up on the site, which will ask them for more information. By executing this step smoothly, you can make sure that your conversion rates will increase significantly. You should use high quality images in your landing page in order to attract people, as it’s proven that content which contain pictures has nearly 95% more views than content which doesn’t not contain images. Images are easier to remember than words, so the pictures that you use in your landing page have a huge impact on how memorable you will be. So, when choosing pictures and design for your landing page, ask yourself these questions. What is your goal? What do yo want people to do? Why people will want to know more informtion about your product? How they feel after buying your product? These questions will help you understand the needs of your customers and, therefore, will help in creating engaging images. Any valuable landing page should have call to action. It will lead people to purchase your product or take another action in their buyer journey. In addition, besides just using call to actions such as “Buy our product”, “Donate us money” or “Subscribe to our new plan” use phrases like “Buy our product now” or “Subscribe to our plan today”, as adding urgency will make visitor take actions immediately rather than leaving it for later. Here you can find some tips to optimize your Call to Action buttons. If you want to get the most out of your landing page, you should ensure that your content will be shared by your visitors in their social media pages. This is very simple: the only thing you should do is adding social networking buttons on your landing page, which will let them share your content in Facebook, Twitter or Google+. So, if your content is shared, you can be sure that it will reach to larger audiences.